Born in November 1960, Gary Lineker made his name as a forward with local club Leicester City, and had already made his England debut before joining Everton in 1985. After one successful season (30 goals in 41 games), Gary Lineker was signed by Barcelona and helped them to win the Spanish Championship, Cup and Cup Winners' Cup between 1986 and 1989. His place in the affections of English football fans was cemented by his Golden Boot-winning performance at the 1986 World Cup Finals in Mexico. And at the 1990 World Cup in Italy, his goals propelled England to the semi-finals where they were beaten by Germany in a penalty shoot-out. Gary retired from international football in 1992. After his stint in Spain he returned to the UK with Tottenham Hotspur where he won the FA Cup in 1992. 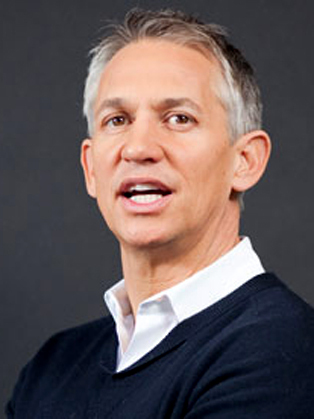 During his playing career, Gary Lineker was one of the best known and widely admired soccer players in the world today. His goal total of 48 for his country places him second on the all-time list behind Sir Bobby Charlton. He has addressed the Oxford Union and he was a team captain in the popular quiz show They Think It’s All Over. During his spell at Barcelona he learned Spanish and whilst at Nagoya Grampus Eight he learnt Japanese. Gary's BBC Television work has included a roving reporter role at the Atlanta Olympic games, the acclaimed Golden Boots series and as a presenter of Football Focus. Gary is now lead presenter on Match of the Day and he is also the face of the extremely popular and successful advertising campaign for Walkers Crisps.